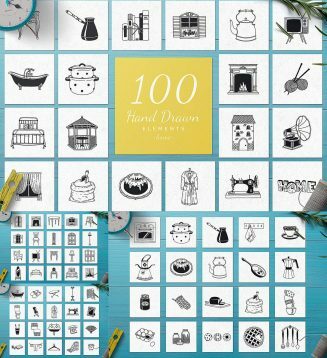 Set of 100 hand drawn home elements with fully vector graphics. Create your own design using these elements. File format: .ai, .png, .eps, .psd for Photoshop or other software. Tags: bathroom, chair, clipart, coffee, door, home, icon, kettle, kitchen, premade logo.